Marloth Kruger Little Manor - Marloth Park Accommodation. Marloth Kruger Little Manor is a holiday home with lots of privacy situated in the Marloth Park Conservancy where game like Giraffe, Kudu, Wildebeest, Impala, Warthog, Ostrich, etc roam freely. Marloth Park is next to the Crocodile River which boarders the Kruger National Park. The house comprise 4 rooms, 3 of which are en suite. The 4th bathroom is for guest using the 4th bed room. 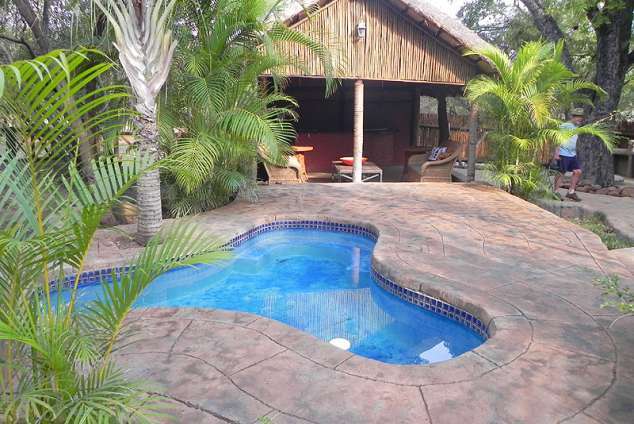 There is also a lounge area with TV and dining area as well as a lapa with a bar / swimming pool and braai area overlooking the bush veld from where you can view the animals in close proximity as well as an abundance of bird life of more than 200 species. Activities in the park comprise walks next to the Crocodile river and several look out spots where you can have sun downers. The Crocodile Bridge gate is only 14 kilometres away and day trips into the Kruger can be arranged for you. You can also go on short hiking trips in the morning in the Kruger accompanied by a Kruger Park field guard or night drives. These trips depart from the Crocodile Bridge entrance. You are also close to other tourist destinations such as the Baberton geological site and Blyde River Panorama route, and Swaziland and Mozambique is very close from Marloth park should you want to visit these countries during your stay. 3030 page views since 18 Jan, 2016.